Battle Circle, by Peirs Anthony is actually a trilogy consisting of the books Sos the Rope (1968), Var the Stick (1972), and Neq the Sword (1975). 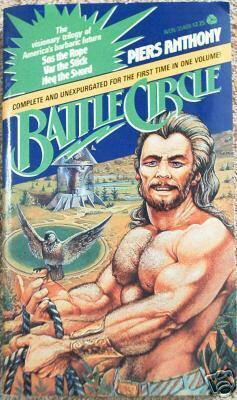 Battle circle was first published in 1978. All the books take place on a post-apocalyptic Earth, in a landscape filled with the ruins of the previous civilization and with large areas still deadly because of radiation. I originally read Battle Circle way back in high school, though I couldn't give you an exact year. It's always been one of those books that stuck with me and that I wanted to revisit. Through the modern marvel of Amazon, I was able to so for a penny (plus $3.99 shipping). The world of Battle Circle takes place mostly in post-apocalyptic America, in a culture primarily made up of wandering nomads who use "battle circles" as the focal points of their society. Men are warriors and women are not much more than companions and mothers, although the occasional exceptional woman finds her way into the circle as well. This is not the story of right after the apocalypse, but rather an unknown number of years into the future, in a new and stable society established after the fall of the old one. The battle circle deserves more of explanation, as it comprises the center of nomad culture. Any and all conflicts are settled, with honor, inside the circle. The enforcement of this tradition has all but eliminated crime and violence outside the circle. There are three segments to the society: the previously mentioned nomads, the crazies, and the (generally unknown) underworlders. The nomads are pretty much what their name implies -- wandering men and women who sometimes come together in groups called tribes. All conflict is settled inside the circle, and men and women are free to choose with whom and when they will pair or marry. The nomad life can be fairly harsh, and life expectancy is not much beyond the 30s. Wandering nomads generally travel from hostel to hostel, partaking of the shelter and supplies (including food and weapons) maintained by the crazies. Each nomad chooses a weapon; there are six traditional weapons available: sword, club, sticks, staff, daggers or morning star, although the occasional esoteric weapons makes its appearance. Men are known by their name and their weapons, thus Sos the Rope, Var the Stick, etc. It is possible to be skilled in more than one weapon, giving us Sol of all weapons, and Tyl of two weapons. These are the weapons used by the nomads to settle their differences in the circle. Of interest is the naming convention used by the nomads, that being consonant-vowel-consonant, followed by their weapon. Women are nameless except when bound to a man (a bond breakable at any time by either party). When bonded, the women's name becomes the man's name plus "a". Children take the father's name plus "i". So the wife of Var would be Vara, and any children they had would all be known as Vari until they achieved adulthood and chose their own name (males) or bonded with a man. The crazies are called thus by the nomads. They usually live in refurbished buildings left over from before the "Blast", the term used for the end of the old world. They are literate and operate the hostels, keeping them supplied. They also gather and maintain knowledge form the old world. Unknown to the nomads, the crazies get their supplies from the underworlders, who live in huge underground manufacturing complexes that produce the supplies the crazies distribute through the hostels. In Sos the rope, Sos meets Sol of All Weapons, a supreme warrior capable of uniting all the tribes. When Sos loses to Sol in the circle, he joins him for one year as his advisor to help grow the empire. Later, Sos, now The Weaponless, returns as an unstoppable behemoth courtesy of pre-Blast technology he received while under the mountain, forced by blackmail to destroy the empire Sol built. Var is a human mutant raised by the Weaponless. The Weaponless, have seen the stagnation of society caused by the underworlders, has decided to bring down the mountain. Through a series of unfortunate events, Var finds himself on the run with Sol's daughter, who happened to be the biological daughter of the Weaponless. Pursued by the Weaponless and Sol, they flee across the breadth of the known world. Neq was once a part of Sol's empire, but the world has grown rife with violence and crime since the Weaponless brought down the mountain. Neq takes it upon himself to bring back the old and stable ways so that the nomad way of life can once again flourish. But first he needs to find the Weaponless and Sol. If all that sounds interesting to you, then you will probably enjoy the book. I'm glad I went back and read it. It's not as engrossing as I remembered, and the characters and plot simpler, but I'm still a big fan of the world Anthony created. It's a quick, fun and inventive read. Maybe I'll revisit it again in another 35 years.